AutoCAD 2011 compatible, high quality general-purpose CAD software with free architectural software module. AutoCAD DWG 2010 and Windows 7 compatible, raster-to-vector software included. Print PDF, DWF, SVG & Google Earth files, IntelliCAD AutoLISP, VBA & DIESEL, ACIS 3D modeling, layers, blocks. Hatch and xref editing. 3D rendering. Best IntelliCAD CAD symbols library. ...... Free raster image conversion, advanced 3D shading and rendering, quick dimension tool, raster-image-to-vector converter and more. DWF, SVG, O2C and Google Earth KML export, IntelliCAD AutoLISP, VBA & DIESEL, ACIS 3D Solids modelling, temporary point snap (oSnap), layers, blocks. Enhanced block data extraction, gradient boundary hatch and xref editing. 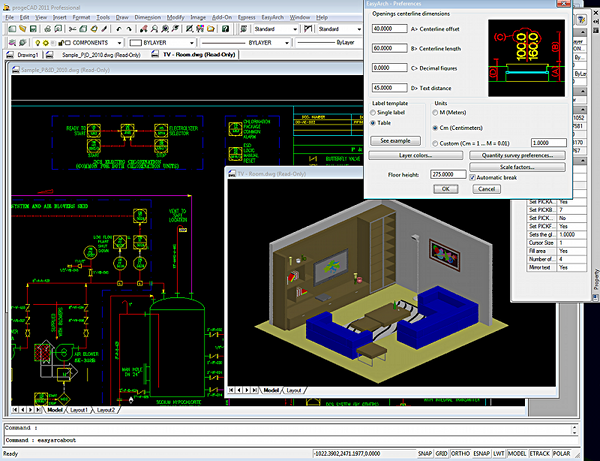 progeCAD Professional includes the best IntelliCAD CAD symbols library manager free. Special upgrade promotion from IntelliCAD, AutoCAD LT, MicroStation, VectorWorks, ArchiCAD, TurboCAD Pro, Chief Architect, ZwCAD, BricsCAD Vectorworks and other CAD versions. Easy to learn. progeCAD professional includes Express-Tools, Architectural software add-on, Free technical support in Australia, Europe, Worldwide by progeSOFT and CADDIT.net ( caddit.net/intellicad/intellicad.php ). Full international commercial license suited for business use. Qweas is providing links to progeCAD Professional 2011 DWG CAD 11.0.8.32 as a courtesy, and makes no representations regarding progeCAD Professional 2011 DWG CAD or any other applications or any information related thereto. Any questions, complaints or claims regarding this application progeCAD Professional 2011 DWG CAD 11.0.8.32 must be directed to the appropriate software vendor. You may click the publisher link of progeCAD Professional 2011 DWG CAD on the top of this page to get more details about the vendor.